Successful construction is often attributed to one or more aspects of the delivery process from good planning, design and clever engineering to efficient project management and quality construction. Before any of these disciplines can begin, they all require some form of procurement to select the team or supply chain to meet a client's or a project's specific requirements. The concept of PSE - Purchase and Supplier Engineering - originated in the procurement of the construction and infrastructure required to stage the 30th Olympiad in London during 2012. At the time of writing PSE has successfully delivered almost £25bn of public procurement meeting client and project requirements and without legal challenge. The construction of the venues and infrastructure needed to stage London 2012 was such a resounding success that it boosted not only the reputation of the UK construction industry but also the confidence of the UK population in the country's ability to organise, build and run a major international event. Its success has been lauded as something from which clients and industry could learn. The ODA has established a comprehensive and informative body of evidence as part of a Learning Legacy. While the ODA is well aware of the many elements of the procurement and supply chain management, the complete end to end concept of how the Olympic supply chain procurements were managed has until now not been captured. For example, how does one buy the stage for an Olympic Games? How does one manage the details of thousands of contracts and the many firms of contractors, subcontractors and material suppliers and ensure that no one organisation adversely affects any other to the detriment of the programme? How are a client's requirements beyond those of the capital asset realised as part of the investment? How does one measure programme exposure, or manage performance? How does one measure capacity and the ability of firms to cope with the work and manage the risks involved? 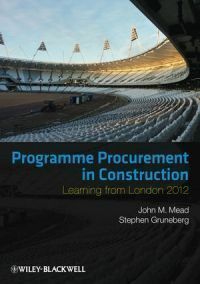 Programme Procurement in Construction: Learning from London 2012 covers the planning and preparation of a programme's procurement processes from understanding and developing the client's requirements, to monitoring performance based on the benchmarks contractors set out in their own tender submissions. The emphasis is on a close attention to detail to avoid surprises, while keeping a focus on the total programme. Purchase and Supplier Engineering provides an overview of managing the interest of firms in participating and the resulting capacity and workloads of all suppliers, including the main contractors and the critical subcontractors and material suppliers. Offering techniques, tips and lessons learnt from the implementation of PSE on London 2012 and Crossrail, this book is aimed at public and private sector clients, developers, senior management and those businesses and professionals involved in undertaking the procurement, supply chain management and delivery of multiple construction projects or complex major construction programmes.